Well let me start by saying I apologize for the intro picture where I am shoving the fish down the camera lens. I was excited to do an Instagram photo and just wanted to use a little artistic license. 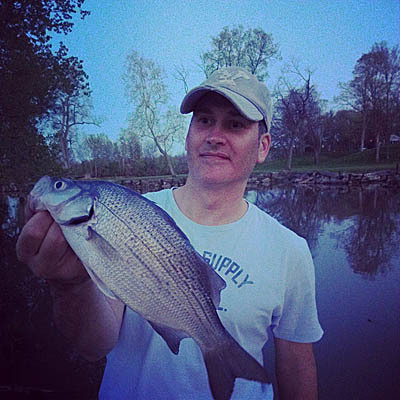 It was a dandy of a White Bass, but of course it’s never easy to judge when you hold a fish out like that. Please forgive me. The Walleye Run is over by most accounts, but I was thrilled to be on the front end of the White Bass Run. It seems like deja vu with 2013, no time during the Walleye, but a better schedule by the time the White Bass were showing up. I ended up fishing north of Fremont, Ohio, with my friends Darrin and Leo. Overall, the results were pretty good with plenty of White Bass, White Perch, Channel Catfish and a single giant Freshwater Drum. A few carp and buffalo were inadvertently snagged into, all popping off before coming to the net. The majority of the fish hit on Emerald Shiners on a 1/32 oz. jig, under a float. The bite was best right at dusk and shortly into the night, right as we were leaving. The next few weeks should be good! no apologies needed for that picture, that is a dandy! Thanks Blake, was a fun day for sure.